Subtle is not a word normally associated with custom vehicles. It does not fit a truck with gigantic wheels and enough power to move a small building. Once you get past the conspicuous details, project "Tarmac" is more subtle. Lacking a crazy paint job, ground-scraping stance and wild body modifications, this truck is all about class. Wearing jet black paint like a tailored tuxedo, this truck displays a repertoire of modifications that require effort to fully appreciate. The hood and grill look vaguely familiar yet distinct. The door handles have been changed but only hint at more extensive modifications such as the suicide rear doors. The trim, tail lights and emblems add unique touches. Although many of the alternations appear subtle, they create a unique package of understated refinement that defines this custom truck. Project Tarmac is the latest creation by Casey Scranton of CGS Performance Products. His company manufactures custom intakes and cat-back exhaust systems in Chino, CA. 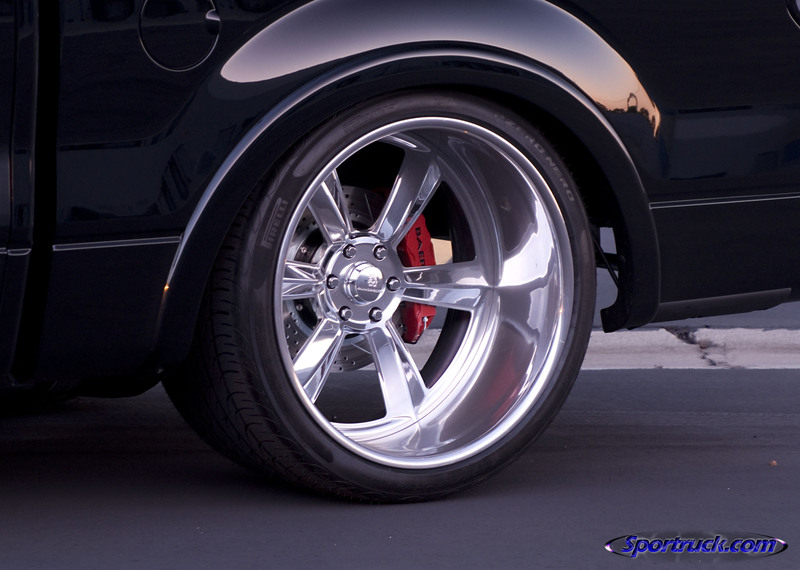 CGS is also known for building custom vehicles that have appeared in countless magazines and car shows, including the SEMA Show. Casey and SEMA go back a long way. His first vehicle appeared at the SEMA Show 19 years ago; every vehicle he has owned since then has been at the show. Armed with a rendering by Luis Tanahara, Casey approached Ford with his project idea. Ford granted him free reign over a new 2011 F-150. 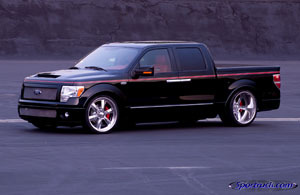 From the start, the truck was destined to be in Ford's booth at SEMA. After acquiring the truck in the middle of July, Casey wasted no time getting it back to his shop to tear apart. By November, just over three months after work began, the finished product debuted in Ford's booth at SEMA. It sat like a guest of honor in a prominent location at the entrance of Central Hall. 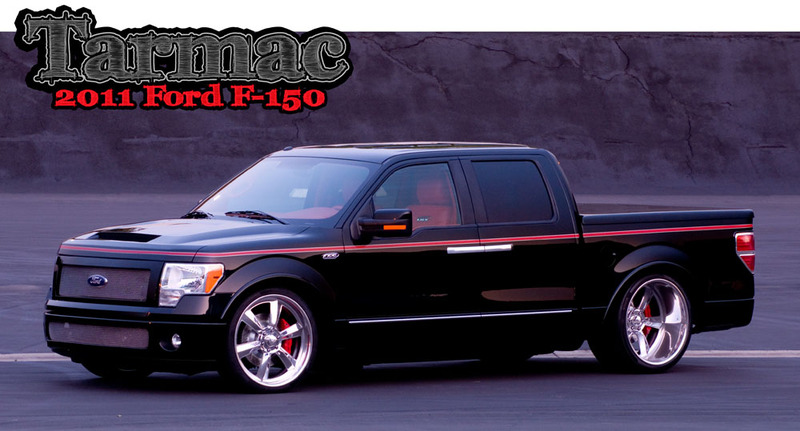 The truck started as an ordinary factory-fresh 2011 Ford F-150 Lariat SuperCrew. The 5.0L Ti-VCT V8 engine was fitted with a CGS Performance cold air intake leading to a Whipple twin-screw supercharger. A Hose Candy engine hose kit provides additional style under the hood. No sport truck is complete without a street-friendly stance. 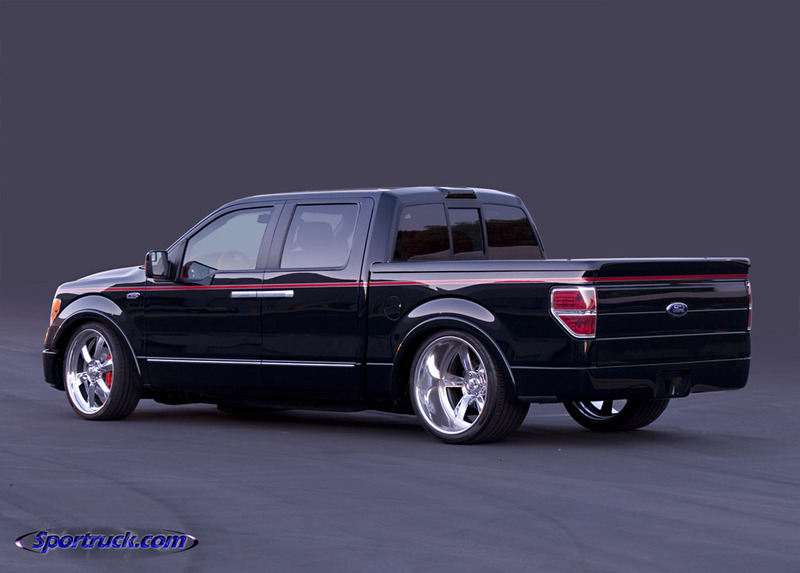 This truck was brought down using Belltech front coilovers with modified springs to drop the nose about 6 inches from stock. In back, the rear leaf springs were replaced with a custom-built triangulated 4-link combined with coilover units from Chris Alston's Chassisworks. The lower links sit below the frame rail to allow clearance for massive wheels and tires, while the upper triangulated links attach to the center of the frame via a custom crossmember. CGS notched the rear frame rail to provide axle clearance for the lower ride height. Devious Customs built the notch to extend only 2.5 inches above frame rail to prevent it from protruding into the bed floor. A set of Colorado Custom billet Super Max wheels, sized 24x9 in front and a whopping 24x16 in back, fill up the wheel wells. Pirelli tires measuring 285/30/24 front and massive 405/25/24 in back put the power to the pavement. To accommodate the super-wide tires, the rear wheel wells were widened by moving the stock tubs in. 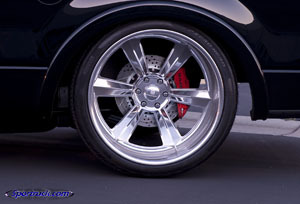 The 10-inch lip on the rear wheels was made possible by narrowing the rear end 15-inches in total (7.5-inches per side). Currie Enterprises worked their magic on the rear end and installed new axles as well as Ford 9-inch flanges to facilitate the mounting of custom brakes. The Baer brakes at all four corners utilize 6-piston calipers and 15-inch rotors. The truck received its fair share of body modifications. First, the stock grill shell was removed from the hood and sectioned 5-inches vertically. The factory aluminum hood was reconfigured by filling in the front area previously occupied by the grill shell. A scoop was fabricated and grafted into the hood while a perforated aluminum insert fills the vent hole. Next, the front bumper opening was enlarged to match the width of the main grill. Finally, the grill shell and bumper were fitted with T-rex stainless steel mesh inserts. CGS started from scratch on a set of billet door handles. 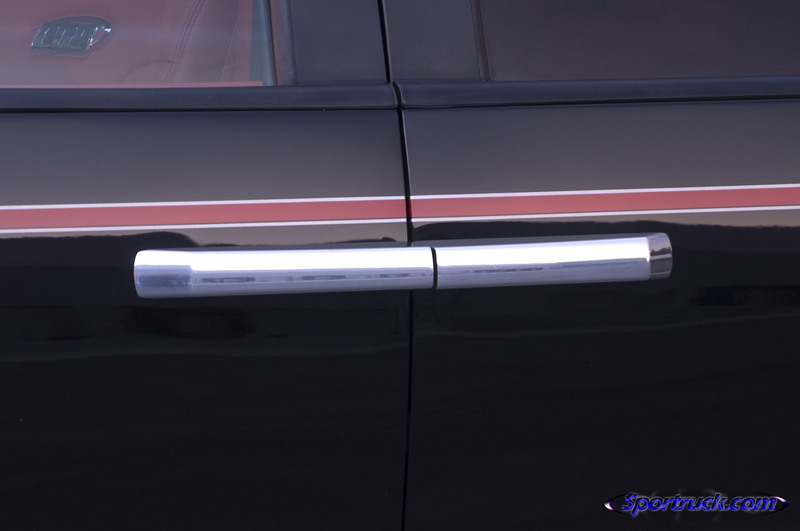 The stock door handles were removed and the door skins were shaved smooth. Each new handle was machined from a solid block of aluminum and features an integrated switch underneath to trigger a solenoid that unlatches each door. Trick handles are only half of the story. 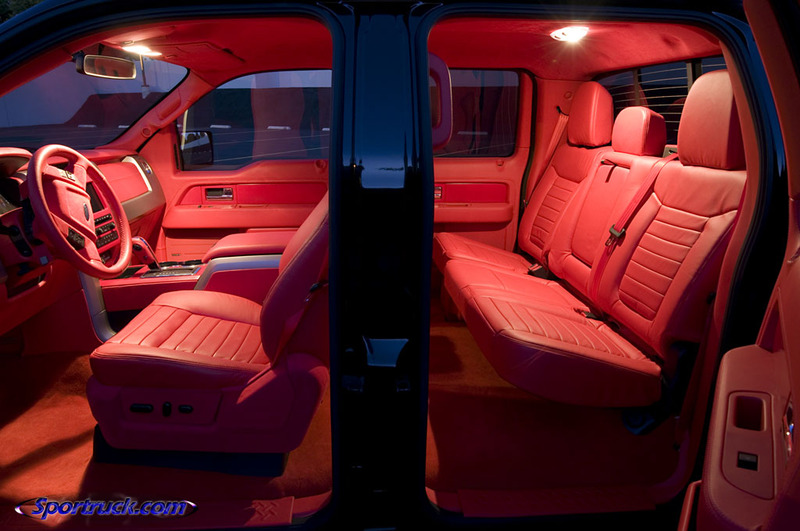 The rear doors were reversed using Street Dreams suicide door hinges. Rounding out the back of the truck, a Gaylord's tonneau cover adds style and convenience. The tailgate was smoothed using a Street Scene tailgate handle relocator while the rear bumper was replaced with a Street Scene steel roll pan. One of the subtle changes you may not notice is the tail light treatment. The stock units were disassembled, the lenses were painted candy red inside, then the edge of the lens was painted black. The entire unit was sprayed with clear and buffed to give a clean, seamless appearance that blends with the rest of the truck. 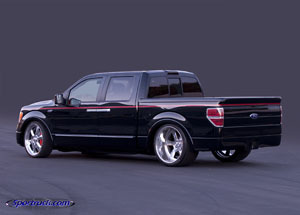 With the body work complete, the truck headed to L&G Customs in San Dimas for the Dupont Jet Black paint. Andy Meeh laid down the color, including a Boyd Red stripe that surrounds the beltline and is bordered by a metallic silver pinstripe detail also applied by airbrushing. 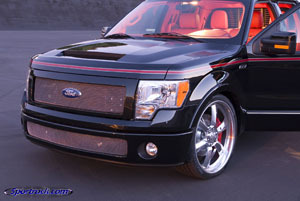 Finish details include a custom-fitted Clayton Machine Works billet aluminum trim kit that adorns the rockers and CGS emblems to ornament the fenders. The inside is bathed in a sea of red. Seats and interior panels are covered in ample amounts of luxurious red Pecca Leather. A matching shade of red suede covers the headliner and horn button on the steering wheel. 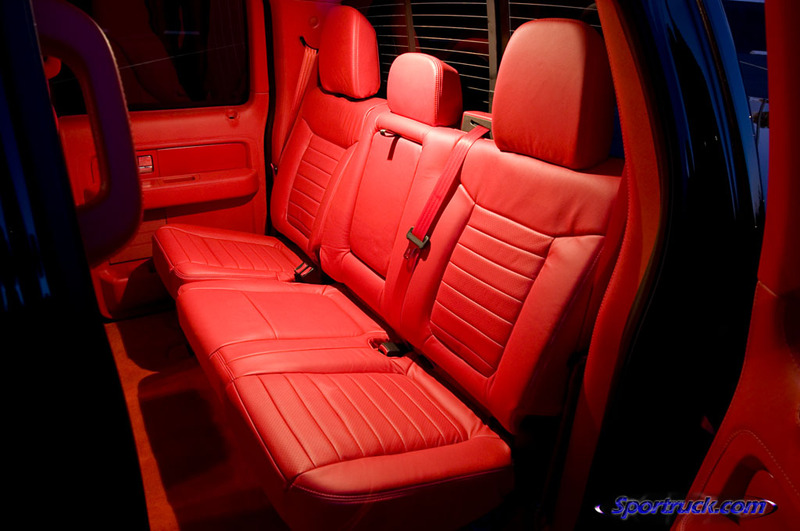 The consistent color scheme continues with Porsche red carpet and red seat belts from Seatbeltplanet. 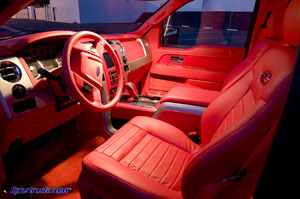 Vizualogic headrest monitors provide entertainment and a set of CGS emblems in the seat backs completes the interior. With the truck only recently finished, Casey has plans to hit the show circuit over the upcoming year. The project would never have been completed with help from numerous sponsors and friends, including Robert Henry of InDesign. If you don't see Tarmac in person, you can still own it -- in miniature form. XTR Toys will release a small-scale version of the truck early next year.